Last night, I headed to the barn with the intent to longe. I wanted to see how Tris was feeling; I am still (still) not breathing without mucus, at least not exercising. So riding was out. I put the longe line on and then saw that someone had closed the indoor up tight and even organized it a bit: all the doors were closed and latched and some of the usual chairs, etc., that were often out were tucked away. So I did not bother with the longe line. We spent about 20 minutes working at liberty. 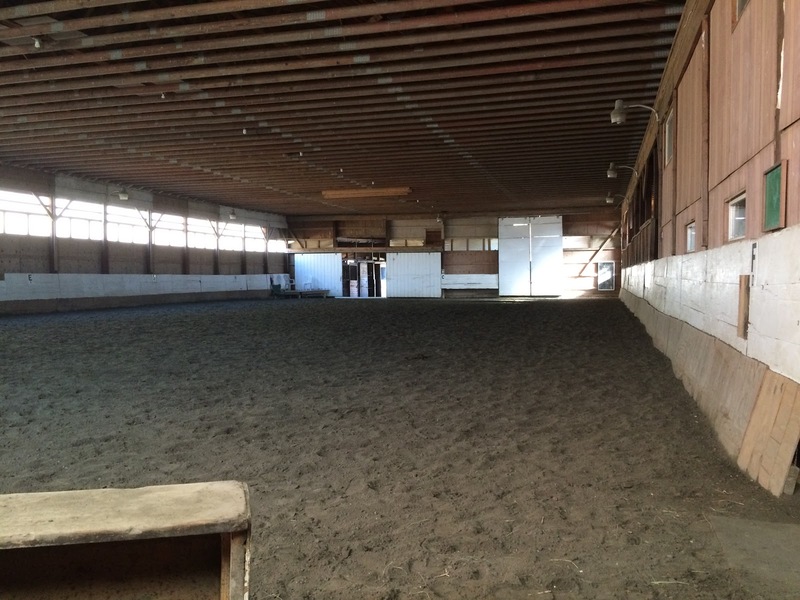 Our indoor, with doors open in the back. Now, I don’t buy into the natural horsemanship join up sparkly hearts kind of working at liberty. I’ve never done any of the Parelli levels. I’ve never bought any specialized equipment or followed any schools of thought or anything like that. I have worked Tristan at liberty on and off in the years I’ve owned him. More in the beginning, in a round pen that allowed him some space but didn’t mean he went too far. My philosophy is as such: work at liberty should be used as a tool to fine-tune our communications. Tristan should not simply use it as an excuse to sprint off bucking and then investigate all the corners. He is allowed more leeway, sure. If he wants to take off bucking that’s ok, but he should then re-focus on me. So our rules last night were simple: we both had to keep moving at all times, and Tristan had to stay focused on me and listen to what I told him to do. I feel like any kind of in-hand session progresses best when Tristan gets sharper and sharper off my commands. Last night, we definitely accomplished that. I walked or jogged alongside him around the edge of the ring, because I am in terrible shape and also needed to move. So he did a lot of bucking and farting around, occasionally in sass to what I was asking him to do. He opted to start off cantering quite a bit, which was fine by me. I think liberty work can be a useful tool for helping see how your horse prefers to move. He’s been telling me under saddle that he would rather canter for a while first, so I let him do what he wanted, figuring I would observe and see more of what I was feeling from the saddle. After several turns at the canter, he settled back to the trot when I asked, and it was not all that pretty: propped, short-strided. So I brought him back to the walk, then asked him to go forward, and let him canter again for a bit. After that, his trot was much more fluid, and after 10 minutes or so he started to stretch down his neck and come up through his back. He also very much preferred to track right, though I asked him to turn from time to time. So that told me more, as well, which was also not a surprise – he prefers to move to the right. I also worked on getting him to halt, back up, and walk and trot bigger or smaller based on body language. I carried a longe whip but mostly left it trailing on the ground behind me. He clearly had a lot of fun, which was nice. He gave me some lovely big ear-pricked trots around the outside of the ring, and was W-T-C and back from voice commands from a fair distance. I was really, really pleased with him, and he was clearly becoming more comfortable and happier in his body. Liberty work also gives me the chance to really just watch him, to focus on one leg or one muscle grouping, the way he used different parts of his body. 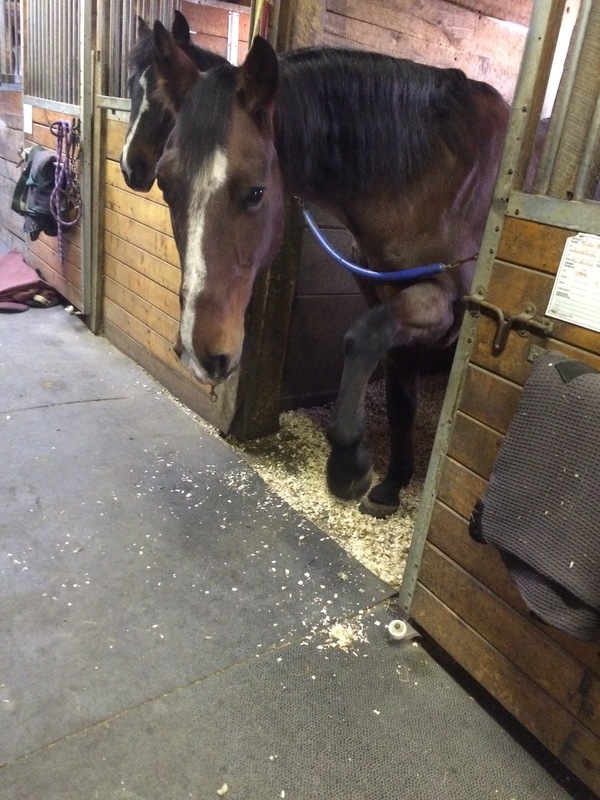 omg that stall pic is entirely too cute!